Although some teams have wrapped up, there are several teams with key games ahead. The Old Boys already had their playoff game, and lost a tough one to a strong Shamrocks team. As we all get a break for Memorial Day weekend, and some teams have wrapped up, there are several teams with key games ahead. With the inaugural Over 35 division limited to only 6 teams there is a fair amount of repetition in the scheduling. So it was that the Legends were once again featuring a Banatul team that 11 men had comprehensively beaten two weeks previously. The largest squad of the season did not augur well for Banatul. However, for some reason the Legends started the game sluggishly and Banatul were able to keep possession and take advantage of unnecessary sloppiness by CPR. While the defence was dangerously composed with the ball in trying to pass it out from the back, the attacking midfield and forwards were playing hot potato with the ball and losing possession. The extra players on the sidelines also caused uncharacteristic foolishness during the substitutes with 12 men on the field for about a minute, not that the referee was paying any real attention. Fortunately, Banatul were able to count a +1 on their behalf with a refereeing performance for the ages. In an Over 35 league the bar is already set low for refereeing, but at the least you would expect the officials to know the basic minimum rules that most people learn in single digits, such as what constitutes offside. Hint: When you pass the ball backwards to an open man and they score, its not offside regardless of the fact that no defender is close to them since the striker outran them all. After Baron opened to scoring with a surging run from midfield, a great run and cross by Vale to an open Casanova was mystifyingly disallowed for Offside despite the fact that Vale was crossing the ball back from the byline. A half time enquiry confirmed the fact that not only did the referee not understand the offside rule but had no intention of discussing it. To add insult to injury, his clear thick skin resulted in numerous bookings for verbal backtalk yet no bookings for elbows thrown or tackles from behind. This was a game that abysmal officiating could well have caused physical altercations, but fortunately cooler older heads on both sides helped tamp down the testosterone. After Banatul had a fortunate equalizer a trademark long range shot from Pattinson restored the lead. Casanova soon added two opportunistic goals taking advantage of defensive mistakes, exacerbating the poor offside decision in the first half as it would have been his first CPR hattrick in 15 seasons playing for CPR. With Banatul playing a high line with a slow defence, they gambled on the fact that the referee would bail them out with continuously awful offsides calls. Indeed, the performance was so bad that usually phlegmatic characters like Chris Williams were screaming in rage. Lesson #1: This is a ball. Learn this before next season! In the end, the referee’s performance(?!) was the only thing noteworthy about an otherwise forgettable 4-1 win. Although 4th out of 6th for the season may seem disappointing, the Legends were actually only 3 points out of the runners up spot with comparable goal difference, so a good bounce here or there would have been enough for them to jump the pack. With the squad vastly improved from that of Fall, there is much promise for next season. Old Man of the Match: Casanova gets an honorary mention with two opportunistic goals, but no show to the bar was the defining trigger. Statistic of the week: It should have been Casanova’s first hattrick for CPR in 15 seasons. Thanks Ref. Use your money for the game to buy a rulebook. Team Bar Night: 3.5 out of 5. Solid day at the pub, commiserating with the Old Boyz regarding referee buffoonery. After a few hours continued festivities back on the UWS. 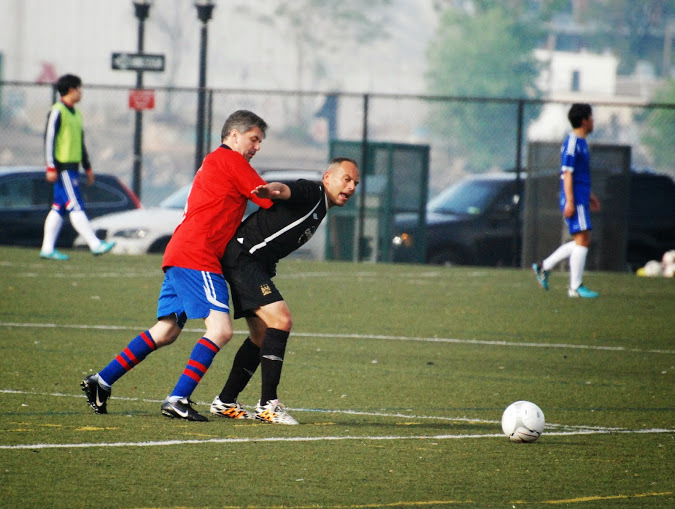 Reserves needed a win against bottom-of-the-table Hoboken to secure first place in the group, but with the focus on the first team’s relegation battle, the game had a bit of hot Sunday “stroll in the park” feeling. 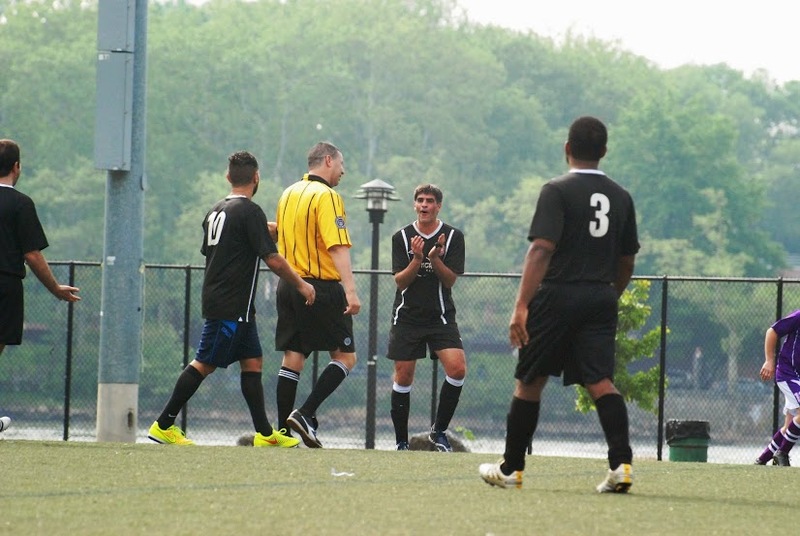 The feeling was confirmed when within 15 seconds, the Hoboken right back was lightly pressured by Brent and just passed the ball to Alberto who scored easily. This may have been the fastest goal in CPR history. That particular episode was rather misleading, and Jon had to make a good save to keep us in the lead after persistent Hoboken pressure in the first 5 minutes. We settled down eventually and started to dominate possession, Alberto took advantage of Hoboken’s high line to play Mike Boas through on goal, and Mike converted to double the lead. Feeling the heat and losing two players to injury, we then stopped playing completely and conceded two goals to leave us red-faced in more than one way at the half. Despite having no subs for the rest of the game, we stepped up the level in the 2nd half and regained the lead, this time Mike returned the favor to Alberto. A 4th goal followed quickly, Saidou lobbed the keeper to score for the second week in a row. With the 1st team getting ready to play, I wasn’t paying too much attention from this point on, but I did notice that Brent hid the post, we conceded another goal, and then restored a 2-goal lead with Alberto getting his well-deserved hat-trick. Final score 5-3. Result: 2-2 (2-1 at H/T). Legends played very well, but it was a tall task with only 12 players. Second half just didn’t have the same energy to defend in numbers and to make attacking runs. Both teams easily could have scored a third, so a draw seemed a fair result. Old Man of the Match: Teesdale. Played out of position in the middle and shut down everything that came his way. Honorable mention to Luciano who as usual had solid game in the middle. Honorable mention to Williams/Enticott who ran tirelessly and kept the Barnstonwoth defense on their heels and help create lots of chances. 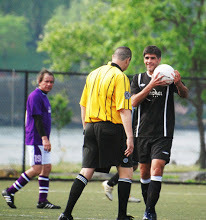 Williams arguable scored Legends third on a very questionable offsides call. Team Bar Night: 0 out of 5. Asked at the field, but no one had it in them to make the trip to Percy’s which may or may not have been open at 1020am. Richie Kavanagh stormed his way to tie Timur Mone in the golden boot race with 4 goals. The other highlight from the game came from Blake Berg on a rocket blasted from the top of the box into the top right corner of the net. It was a comfortable win to end the season and a reminder of how great the Reds were this season. Below are some key comparisons from last year to this in what was an almost worst to almost first transition. The Reds finished 2nd place with 36pts after finishing 2nd to last in the East Division last year. Below are the team stats for the season.